Legal news for New Hampshire work-related firefighter death attorneys – One firefighter was injured and a family displaced in a house blaze in Hancock. 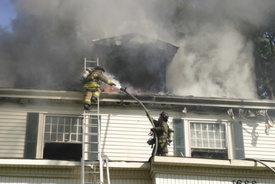 Hancock, NH (NewYorkInjuryNews.com) – A two-alarm blaze displaced one family and injured one firefighter combating the flames at a residence in Hancock, Monday morning, February 22, 2010, as reported by WMUR. Firefighters rushed to the scene of the blaze reported at 106 North Road shortly before 6 a.m. on Monday morning. When firefighters arrived, they reportedly saw flames coming out of the house chimney. The family was said to have escaped from the house before it became an inferno. Firefighters entered the burning structure to face the black smoky conditions to fight the flames from the inside of the house as the fire continued to grow. One firefighter sustained injuries in the blaze. The firefighter was a part of the group in the burning structure. He had slipped while going up the stairway and fractured his wrist. It was not said if he was treated at the scene by medical professionals, or taken to an area hospital. The family room and the attic were severely damaged by the flames, heat and excessive smoke. The kitchen and dining room also sustained damages from smoke and the intense heat. Firefighters combated the blaze for an hour and a half before bringing the flames under control. It was believed that the fire began in the family’s wood stove and chimney. The investigation continues.